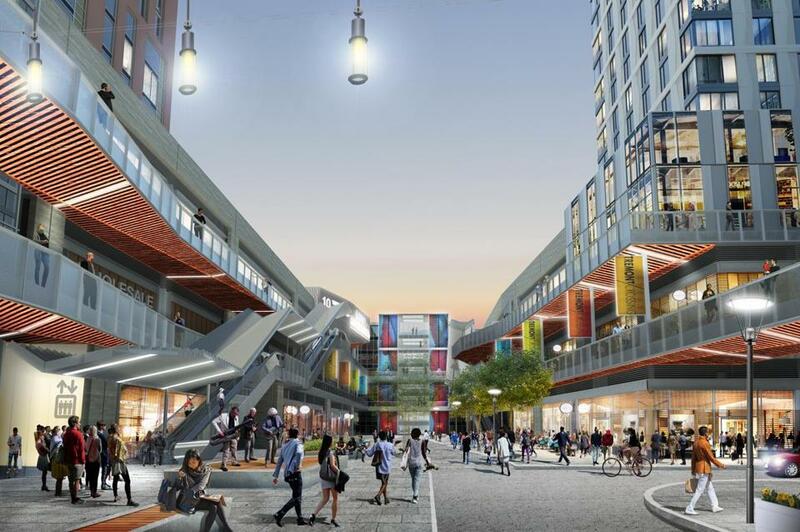 The planned retail center at Tremont Crossing in Roxbury. The board of the Boston Planning & Development Agency approved Tremont Crossing, which would put 718 apartments, a large retail center, and a new Museum of the National Center of Afro-American Artists at the corner of Tremont and Whittier streets. At $500 million or more and 1.2 million square feet, it would be the largest project to launch in Roxbury during the current development boom and will enliven a stretch of Tremont that has long been eyed by the city for new construction. Indeed, planning for Tremont Crossing began in 2007, when Elma Lewis Partners won the right to develop the city-owned site, with plans for a new museum there. At one point it was also seen as an office destination, with then-Mayor Thomas M. Menino trying to lure Partners Healthcare to the site and then-Governor Deval Patrick vowing to move the headquarters of the Massachusetts Department of Transportation there. Both plans fell through, and now Elma Lewis, along with development partner Feldco, is planning two apartment buildings, a retail complex with big-box stores including a BJ’s Wholesale Club and potentially a movie theater, a smaller office component, and, still, the arts museum. Dozens of residents spoke in favor of the project, saying it would bring a much-needed cultural facility, retail opportunities, and new housing to the neighborhood. There was also vocal opposition, from residents who said the development, despite its huge size, includes too little affordable housing and won’t do enough to create good jobs and homeownership in the area. Thursday’s vote is not the final word. The developers will need to nail down financing and submit more advanced drawings before they win final BPDA approval. But the vote represents a big step for a project that has been stalled for almost five years. Stephanie Thomas, who lives across the street at the Whittier Street housing development, said she’s ready for Tremont Crossing to get started. The board also approved new zoning rules for the downtown waterfront that would make way for developer Don Chiofaro’s long-planned skyscraper on the site of the Boston Harbor Garage. The plans took four years to design and will now go to state environmental officials for approval. Executives with Chiofaro Co. said they hope to have an updated plan later this year.